Posted by V the K at 8:11 pm - April 3, 2015. Posted by V the K at 6:28 pm - February 28, 2014. Thanks to commenter Annie. This is an angle I had not considered. Read the whole thing, and note how polite and supportive the WashTimes commenters are toward her. Posted by B. Daniel Blatt at 8:23 pm - September 30, 2010. I’ve been major-league sick since returning from New York City on Sunday night. Fever, stuffy head — fullblown NyQuil cold. Anyway, my apologies for the silence — I haven’t felt much like doing anything but staying in bed. Regarding post-HOMOCON stories, thanks to Dan for keeping up with it. I may have more to say, but I think Lisa DePasquale who was there had the best article (which Dan linked to earlier this week). Anyway, aside from the cold — New York & HOMOCON was a blast. I got to meet a number of long-time GayPatriot readers and others in the Gay Conservative movement. New and old friends alike! A special thanks to the lovely and smart Tammy Bruce and John Phillips (handsome & smart!) for their hospitality Saturday evening!!! Another Reason to Come to NYC for HOMOCON 2010! Posted by B. Daniel Blatt at 7:04 pm - August 30, 2010. Well, first reason for this post is that tickets for HOMOCON 2010 are nearly sold-out! But the REAL reason is to provide some extra impetus for you to consider a trip to Manhattan: TAMMY BRUCE is coming. Yep, if Ann Coulter wasn’t enough, our own Queen Conservative Diva Ms. Bruce will be there now, too! So what are ya waiting for? 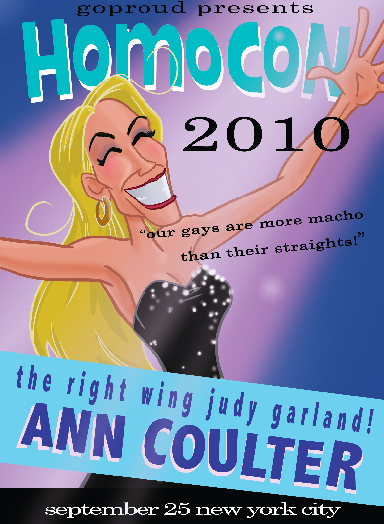 Join a buncha Gay Patriots in NYC on Sept. 25 for HOMOCON 2010! Posted by Bruce Carroll at 2:37 pm - July 29, 2010. I’m told the event is going to be full of fun surprises, so you won’t want to miss it. How could you NOT want to spend an evening with the Queen Conservative Diva herself?!? Posted by B. Daniel Blatt at 9:27 am - June 10, 2010. Among the many topics touched upon last night in the most marvelous Boston dinner (great food and amazing conversation), we discussed Sarah Palin. We all admired the former Alaska Governor (though to varying degrees), but also agreed that she’s not positioning herself well for the White House. That said, another woman we GayPatriots all admire, the magnificent and munificent (with her wisdom) Tammy Bruce has interviewed that accomplished woman. And if two such talented women appear together in the same podcast, it surely merits your attention. Posted by B. Daniel Blatt at 6:02 pm - May 10, 2010. You just gotta love our Queen Conservative Diva (I created a new title). On Friday, I noted that anti-gay activist Ryan Sorba, in the process of angling for a role in a CNN documentary, challenged prominent gay conservative Tammy Bruce to a debate. Let Tammy Bruce and/or Andrew Sullivan know that I am going to publicly challenge both to a debate soon! I was amused by Ryan Sorba’s declaration that he would be soon calling for a debate between himself and either me or Andrew Sullivan. I have a better idea — I would suggest Sorba ‘debate’ Ted Haggard, Bob Allen or perhaps even George Alan Rekers. 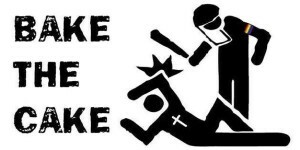 I think that might prove more interesting, and would certainly help shed some light on how hypocritical homophobic bigotry has been masquerading as an element of both Christianity and conservatism for far too long. Frankly, I do find it rather odd that homosexuality seems to be more on the minds of certain so-called religious conservatives than it is for most of my gay friends. In the meantime, as the new chair of the Advisory Council of GOProud, I’m excited to be able to do further work promoting how authentically conservative ideals improve the quality of everyone’s lives, especially gays and other minorities. We are only truly free as individuals when we are able to make life choices that best suit us. That requires limited government, lower taxes, and personal responsibility. This is the conservative message I embrace, that compels the Tea Party movement, and will transform this nation on November 2nd. Bruce, who appears frequently on Fox News, has quite a bit more credibility with conservatives than Sorba, whom even some gay marriage opponents consider needlessly abrasive. Hence, smack-downs like this. HAHAHAHA. Ryan Sorba — what a tool. I’d pay to see this debate. She’ll eat him alive. By the way, can we PLEASE stop the notion that Andrew Sullivan is a conservative. For crying out loud!